* Go Pro: Want to be a commercial photographer, making big money doing big shots? Here’s Chase Jarvis’ latest video on how to do it — step by step. * Do Good Work: Another behind the scenes, this from Nikon shooter Joe McNally, who shows us his technique (and his good heart) in making a father’s photo dreams come true. 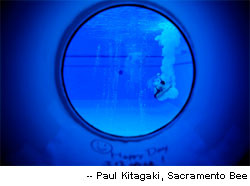 * Big Shots: The Sacramento Bee newspaper launches a photo blog (see Olympic prep picture at left). It’s cool, but not as oversized-cool as this one at Boston.com. * Hip Hop: Take a strobe outdoors, get some well-dressed hip-hoppers and you make a photo essay, like this one in JPG magazine. * Vacation Blues: If you freelance and take a vacation, do you tell your clients? Maybe you shouldn’t, suggests John Harrington on his blog about the business of photography. This entry was posted in Grab Shots.